New Orleans native Dr. Michael Lange was born and raised in Louisiana. An avid sportsman, he participated in many traditional sports like football, basketball, and track and field. He was racing competitive motocross during his senior year in high school when he broke his leg and his neck in five places. His ambition for a career in motocross ended there. Dr. Michael Lange received his first degree from the University of Southern Mississippi in psychology. He then went to Pennsylvania College of Optometry and became a board-certified optometric physician. He received his second degree during his second year at optometry school in physiological optics. Right out of school he began working for a Dr. Charles Glaser at his optometry practice back in Louisiana. Less than a year later, Dr. Michael Lange opened his own practice in Ocala, Florida, in 1993. With the unexpected help of radio star Country Jim Kirk, Dr. Michael Lange began hosting a daily radio talk show, ‘Sound Off with Dr. Lange’. It has since grown into a syndicated radio show called ‘Ask the Doctor’. As the radio show and Dr. Michael Lange’s practice grew in popularity, he opened 12 more locations all around Florida, and then the Lange Eye Institute in The Villages. Around 2016, a big corporation offered to buy all of his practice’s locations. 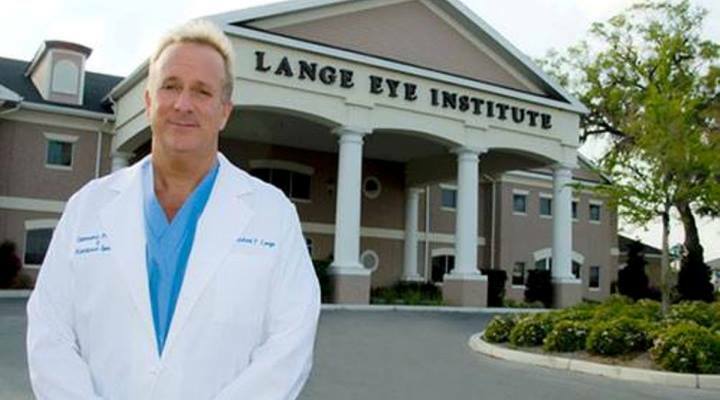 Not ready to retire, he kept the Lange Eye Institute. In addition, Dr. Michael Lange is also a certified nutrition specialist and owns a company called Fortifeye Vitamins where he develops vitamins to help slow down and stabilize diseases in the eye. When he’s not at work or doing research for his vitamins, Dr. Michael Lange divides his free time between racing his two NASA and SCCA sanctioned Dodge Vipers all over the U.S. and traveling nationally and internationally for his daughter’s volleyball tournaments. This father of four, a son, a daughter, and two stepdaughters, lives a very full life. How did you get started in optometry? What inspired you? My dad’s best friend was an ophthalmologist. He was over at the house all the time, we used to go fishing together. I volunteered with him at his office and I really ended up liking the eye after talking with him more; the eye is pretty clean and you don’t have to go in for emergencies where the bones are sticking out of the body. What really intrigued me is how the eye is the window into the body, so we can detect many general health problems from an eye exam. An eye doctor can oftentimes detect ischemic strokes, heart attacks, systemic diseases, high blood pressure, and diabetes. That really intrigued me. My dad also inspired me with his work ethic. He used to get up early in the morning and he didn’t get home until late at night, but he still found time to take us camping, fishing and stuff like that. So we had a good relationship. Starting out I never had any doubts because I always knew I could do it. It’s just that sometimes when you’re working that many hours, you can get a little stressed and you don’t have any free time to relax and de-stress. I grew up in New Orleans so I was accustomed to going out and partying a lot. I learned very quickly in optometry school that you can’t do that and expect to pass, so it was my precursor to buckling down. Sometimes the stress would get a little bit to me in the earlier years and that’s why I ended up biking or running or working out at the gym to help relieve stress. But I never doubted I would succeed and I never in my wildest dreams ever thought that I’d one day be a multimillionaire. Honestly, I just opened my doors and hung up my sign that said Dr. Lange, Optometric Physician. I don’t remember who my first customer was, but I do remember that I had three walk-in patients on my first day on March 15th, 1993. About two weeks later is when Country Jim Kirk came in, and he’s who is somewhat responsible for my success by giving me the opportunity to have my own talk show. He’s the guy in the back of my mind that I’m really thankful for. I’ve done everything in marketing, from direct mail to television, billboards, the internet, and radio ads. But the best thing has definitely been my one-hour talk radio show, Ask the Doctor. It used to be a syndicated show, drive-time out of Tampa Bay from 9 a.m. to 10 a.m. every single day except Sunday, which I did at 1 p.m. New patients would come in because they wanted to see the doctor on the radio show. The toughest thing over the last few months was to determine if I should start working less and spending more time with the family and enjoy racing. And that was a tough decision because I enjoy making money. But I decided at the beginning of the year to only work half days on Monday and to take Fridays off. Now that I have three and a half-day weekend enables me to spend more time with the family and also do more things that I enjoy. I’m hardworking. I’m constantly working but I try to play hard, too. And I have a dynamic personality. So I think it’s my bedside demeanor, my personality, and my work ethics. Another was when I sold almost all of my offices a few years ago to a big corporation. We all go to college so we can get a good job so we can make money and live comfortably. I didn’t realize I was going to open 13 locations and then sell them for a lot of money. So I’d say those making the headlines during the recession on the cover of the magazine and then ultimately selling my practices are my most satisfying moments in business. I’m a certified nutrition specialist from the American College of Nutrition, but one thing that sets me apart is my nutritional eye care. I have people that come from all over the world for a natural approach to their dry eye, to their macular degeneration. So I think continuously researching and developing better supplements, better vitamins, for not only ocular health but for overall health. I think spreading the word more globally for this natural eye care is what I see for the future, trying to treat things in the eye with the least amount of surgery and the least amount of medication to do it. I’m always trying to stay ahead of the curve and any time there’s new technology available, we purchase it. We have the latest advancements at the Institute. We have the newest digital photography, OCT technology for the analysis of the eye. We have a new device called the ANNIDIS RHA that helps detect diseases in the early stages, like an MRI machine for the eye, and it also helps us detect dementia and Alzheimer’s in the eye. We just bought all new technology, all new examination equipment to make sure we have up-to-date equipment in all of our examination rooms. We’re constantly improving our equipment at the Institute. I love my job and I love my patients. I have a unique patient base; patients I’ve been seeing since March of 1993. I like to see these patients, how they do, how we slow down the degenerative phase in their eye, and we slow down aging in their entire body. I like to see the direct response of what I’ve initiated with this patient; losing weight, exercising, the right vitamins, wearing the blue-filtering glasses to protect your eyes, treating their glaucoma macular degeneration and removing their cataracts. Just seeing what I learned in school, what I’ve learned clinically over the years in nutrition, how I put that to use and really seeing how the patient benefits from it. That’s really the best part.